Growing rapidly, your little one is now approximately 2.5cm in length from crown to rump. With every passing day they are taking on a more human shape as the head continues to grow and adopt more recognisable proportions. Now that all the major components of their body are in place, the baby is ready for some significant weight gain. 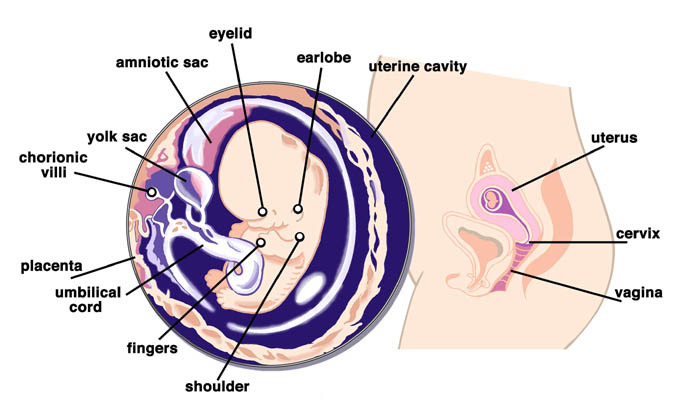 The placenta has developed a lot over recent weeks and is producing very important hormones. It is also producing nutrients essential for the development of the baby, while simultaneously removing their waste products. The heart has now divided into four chambers but is still beating about twice as fast as your own. Don't be too quick to blame the baby if your trousers feel tight, remember it is only about the size of an olive! Feeling bloated or a tightening of your waistband is most likely down to fluid retention at this stage of pregnancy. While nausea may have put you off certain foods, even those you used to love, you may find that you feel quite the opposite about a surprising selection of other foods. There are plenty of amusing stories of how pregnant women start eating gherkins alongside their chocolate cake or lumps of charcoal late at night, but in reality these far-fetched examples are rare. It is, however, common for pregnant women to find that they are craving foods that they wouldn't normally enjoy. Many experts put these cravings down to the raging hormones running riot around your body. However, some follow the theory that these cravings are actually an indication from our body that you are lacking in something nutritionally. It is common to find that while you can no longer stand the smell of your favourite wine, you have an insatiable hunger for a type of fruit or vegetable. There are also plenty of women who couldn't get enough chocolate during their pregnancy. A little indulgence if fine, but be sensible; eating a whole head of broccoli for dinner probably isn't going to cause any harm, but 2 bags of peppermint creams a day isn't going to have a positive effect on your, or your baby's wellbeing. Most women in the UK have their first appointment with a midwife around the 9 week mark. Make sure that you take a list of any questions you may have so your midwife can go through everything with you. You will receive a folder for all of your maternity notes and you will be advised on the schedule for your future antenatal appointments, including ultrasound scans and blood tests. You may be attending a scan around this time of your pregnancy, but don't be concerned if you haven't been scheduled one until 12 weeks. Scans this early on are usually only to confirm pregnancy where there may be some doubt, or so that the health team can establish how far into your pregnancy you are as for some women with an irregular menstrual cycle, tracing the date of conception can be quite difficult. Page generated in 1.3866 seconds.